In our newest blog, we bring you our favourite kitchens from popular TV shows. We will be looking at the main materials used in the kitchen, how it is decorated and the most memorable scenes over the years! Starting off with Don Drapers Kitchen located in the suburbs of New York, this is probably the most retro kitchen on the list! The kitchen is built with a health of wooden units, local vintage shop bought appliances and finished off with stylish flowery curtains! The two things that we particularly love about this is kitchen is the untreated, natural pine that is used for the cabinets, drawers and other units and also the classic checked wallpaper that wraps around the kitchen. The island that’s just off to the left is a great place to prepare meals or perfect for a quick snack, and the gorgeous table is where the whole family can sit down and enjoy their home-cooked food. Now 14 years ago we had to say goodbye to this iconic blue kitchen which starred on one of the most watched sitcoms of the 90’s. We love the show and the kitchen and have a couple of curious facts about it you might not know about! Firstly, Greg Grande, the set designer for the Friend’s set said that when it came to Monica’s apartment, he wanted to develop a “whole new kind of eclectic taste with a flea-market, whimsical, and anything-goes style”. The mixed chairs around the kitchen table varied over the seasons and the view from the back window also seemed to change a few times. And also the fridge actually worked and was kept stocked for the cast and crew! Up next, The Big Bang Theory! The American TV show we all know and love. We will be focusing on Sheldon Cooper’s kitchens located in apartment 4A which is where we see the majority of the characters hanging out and discussing the uncomplicated and simple string theory! This famous kitchen is connected to the main living room, meaning there is plenty of flow throughout the apartment allowing the characters to continuously produce comedy gold with their witty lines and highly funny insults. The kitchen is pretty basic and predominantly made from wood with a few modern appliances such as the fridge and cooker. The kitchen is also heavily decorated with posters, books and a whiteboard! 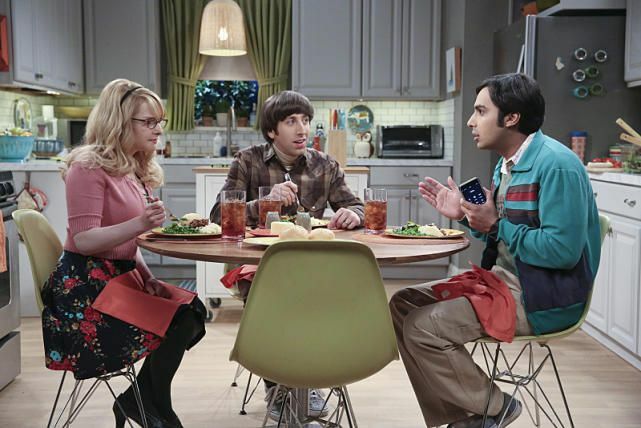 For all you Big Bang Theory fans that would love to decorate your kitchen just like the one you see in the TV series, click here to take you to the page containing all the items in the kitchen that are available to buy! Other kitchens that appear quite frequently in this series include, Penny’s kitchen in flat 4B located directly across from Sheldon’s apartment, and Howard and Bernadette’s traditional grey kitchen. For the final kitchen, we will be looking at Walter Whites from Breaking Bad. This kitchen features a lot in the early season as we are discovering who the family is. We often see Walter White Jr eating his food at the bar asking his dad questions. As we know Walter hides who he really is to his family. There is a big contrast from the kitchen in his house to the one in the labs where he cooks his meth from. The cupboards and drawers are made out of dark wood and the worktop looks like granite. The kitchen also has some pretty old appliances with a small island that has a fold out section to extend the size of the worktop which is used as a prep area. As you can see in this picture the kitchen (and the house) is always pretty dark and not well lit, this could denote his dark/hidden life.